Recognizing the importance of meeting the religious needs of patients and family members, in 1991, Ladies Hospital Aid Society (LHAS) funded the first year of Jewish Chaplaincy in UPMC Presbyterian/Montefiore’s Department of Pastoral Care (currently known as The Office of Spiritual Care). Since that time, LHAS has continued to support and assist in meeting the spiritual and emotional needs of those in distress, regardless of faith, tradition, or spiritual practice. 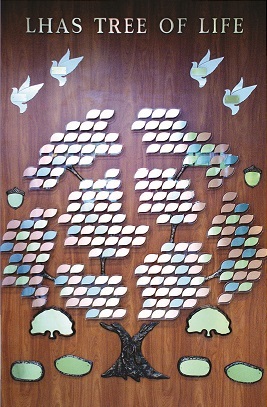 The LHAS Tree of Life is a permanent display that recognizes family members, friends, patients, and donors. The tree is located on 7 Main in the lobby of UPMC Montefiore Hospital and displays personalized inscriptions on acorns, bushes, leaves, doves, and stones. Proceeds raised from the Tree of Life will help support individuals and families during times of spiritual and emotional distress.